The Tertia gown is a contemporary design. A delicate camisole top is crafted in ivory guipure lace layered over Chantillty lace with barely-there taupe rouleau loops straps. 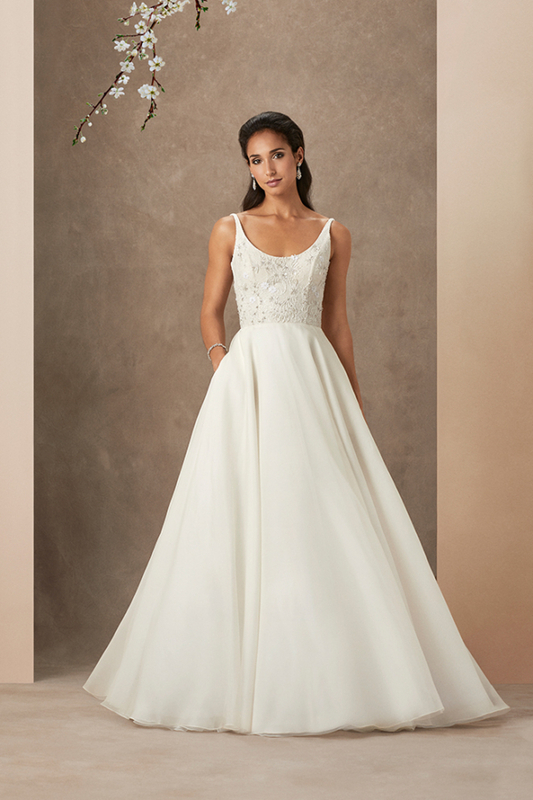 A boned bodice with eyelet panels is cleverly hidden under the structure giving an effortless finish. The deep V neckline is finished with a raw lace edge. Lace applique overlays the silk organza skirt, cut to a full circle to fall in gentle swathes over frilled net petticoats, and flaring into a train. Silk-covered buttons and rouleau loops line the centre back, concealing an eyelet fastening. For a modern touch, Caroline Castigliano has added pockets concealed in the side seams.